Steenstra, Bodie, Conway round out 2019 coaching staff. BOWIE, Md - The Baltimore Orioles announced this week that Buck Britton will be the new manager of the Bowie Baysox when the 2019 season begins. Kennie Steenstra and Keith Bodie return as the pitching and hitting coach, respectively, while Josh Conway joins the staff as an additional coach. Britton, who spent the 2018 season as the manager for the Class-A Delmarva Shorebirds in the South Atlantic League, earned his first managerial stint in Double-A after longtime Baysox manager Gary Kendall was promoted to the same role with Triple-A Norfolk late last week. 2019 marks his second season as a manager for Britton after leading the Shorebirds to a 68-66 record in his managerial debut. The brother of former Orioles closer Zack Britton, Buck becomes the first former Bowie player to manage the Baysox in club history. The former infielder had a nine-year professional career in the minor leagues, predominantly in the Orioles' system. A 35th-round pick in the 2008 draft by Baltimore, Britton started in Rookie Bluefield before a 2009 season that saw him play for Class-A Short Season Aberdeen, Class-A Delmarva, Class-A Advanced Frederick and Double-A Bowie. Up through 2014, Britton bounced between Frederick, Bowie and Triple-A Norfolk before signing minor league contracts with the Los Angeles Dodgers before the 2015 season and the Minnesota Twins before the 2016 season. 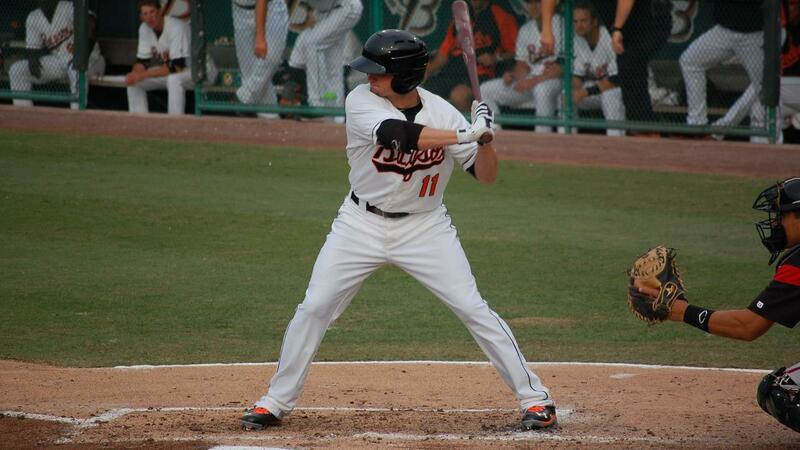 A second baseman primarily, Britton enjoyed a solid statistical season with the Baysox in 2012. Playing in 99 games for Bowie, Britton hit .294 with 23 doubles, a triple and nine home runs, along with 54 RBI. He'd follow up that production with a 52 RBI in 61 games for the Baysox in 2013 and a .317 clip in 61 games for Bowie in 2014. Britton ranks 5th in club history in RBI (171), 7th in hits (337) and doubles (68), & 8th in runs (178). Steenstra returns for his third year in his second stint with the Baysox after previously serving as the pitching coach from 2010-12. In 2017, Steenstra worked with a pitching staff that featured a trio of Eastern League All-Stars in RHP Lucas Long, LHP Tanner Scott and RHP Yefry Ramirez, who was acquired in a midseason trade with the Yankees organization. The Missouri native served as the Frederick (A+) pitching coach from 2013-16 and enters his 15th year in the Orioles organization. Steenstra was drafted by the Chicago Cubs in the 12th round of the 1992 MLB First Year Player Draft and made his major league debut with Chicago (NL) on May 21, 1998. He pitched for 11 years professionally, spending seven years in the Cubs organization before spending time in six different organizations over the remainder of his career. In 2002, Steenstra pitched in six games for the Orioles' then-Triple A affiliate in Rochester. This will be his 15th season within the Oriole organization. Bodie returns for his second year in his second stint as Baysox hitting coach after serving as the manager of the Frederick Keys during the 2016-17 seasons. In 2017, Bodie led the Keys to a Carolina League playoff berth after posting a 37-33 mark in the second half. He previously served as the Baysox hitting coach during the 2015 Eastern League championship season. Bodie holds 30 plus years of coaching experience including 20 years as a manager. From 2012-14, Bodie was the skipper of the Double-A Corpus Christi Hooks in the Houston Astros organization and led the team to a franchise record 83 wins in the 2013 campaign. The Brooklyn native was also a member of the coaching staff for Team USA in the MLB All-Star Futures Game that year. His all-time managerial record is 1,359-1,251 (.521) over his 20 seasons. 2019 will be his 37th season as a professional coach. In his playing days, Bodie spent parts of 10 seasons in the minors with the Mets (1974-1979) and the Astros (1980-82, 1985) after being selected by the Mets in the third round of the 1974 MLB Draft. A product of Coastal Carolina University, Conway was selected in the fourth round of the 2012 draft by the Chicago Cubs and played in the minor leagues for three seasons before entering the coaching world with the Chanticleers in 2017 as an assistant pitching coach. A RHP out of Smithsburg, Md., Conway started 2014 with the Class-A Short Season Boise Hawks before advancing to Class-A Advanced Myrtle Beach the following season. A relief pitcher for much of his professional career, Conway spent 2016 between Double-A Tennessee, Class-A Short Season Eugene and Rookie AZL Cubs. Athletic Trainer Brian Guzman and Strength & Conditioning Coach Pat Armstrong round out the coaching staff for the 2019 Baysox. Guzman enters his second year as the Baysox Athletic Trainer after spending the previous three seasons in the same role in Frederick. The 32-year-old joined the Orioles organization prior to the 2014 campaign, which he spent with the DSL Orioles (Rk.) in the Dominican Summer League as an Athletic Training intern. Armstrong returns for his eighth season as the Strength & Conditioning Coach of the Baysox and his 10th season in the Orioles organization after occupying the role in Delmarva (2011) and Bluefield (2010). The Bowie Baysox 2019 season is presented by Money One Federal Credit Union. The Baysox will return in 2019 to celebrate their 27th Season. The team's 2019 home opener will be Thursday, April 11, against the Harrisburg Senators at 6:35 p.m. To keep up with Baysox news during the offseason, visit baysox.com and be sure to follow the Baysox on Facebook, Twitter and Instagram.